UNITED NATIONS (Sputnik) - The UN Security Council unanimously voted for the extension of the arms embargo against the Central African Republic (CAR) for a year, a press release revealed. 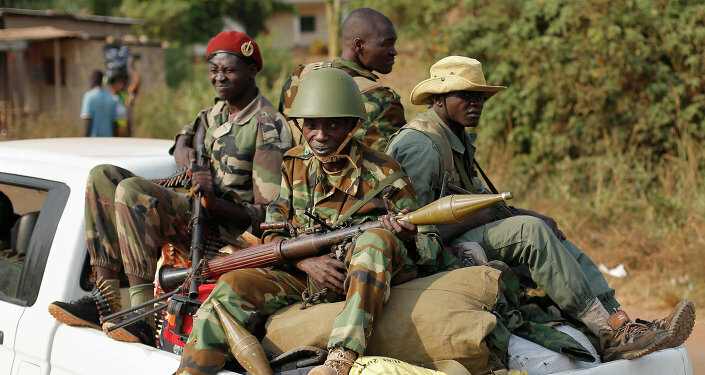 "The Security Council today decided to extend its sanctions regime on the Central African Republic — including an arms embargo, travel ban and assets freeze — until 31 January 2020, while also extending the mandate of the Panel of Experts assisting the Central African Republic Sanctions Committee until 29 February 2020," the release said on Thursday. Under the draft resolution sponsored by France, the Security Council established benchmarks, including reforming the government’s security sector, disarming and demobilizing militias, and managing weapons, that should be met by the end of April to lift the embargo. If the CAR government meets the key benchmarks by 30 September, the Security Council will reconvene to ease the arms embargo measures, the text of the resolution said. The landlocked CAR has been suffering from a drawn-out conflict since a coup in 2013. Much of the fighting in recent years has been between Muslim-majority Seleka and Christian Anti-Balaka militias. The CAR has been suffering from sectarian clashes between the Muslims and the Christians since the 2013 coup, when the Muslim Seleka rebels seized control of the nation, overthrowing then-President Francois Bozize and provoking a backlash from the Christian Anti-Balaka militia. In August 2018, the two groups agreed to establish a platform for consultations on sustainable peace in the CAR. The groups then also called on the government to engage in the work on reconciliation with support from Russia, the European Union and other regional and international players. Kemarsky told Sputnik in December, that Moscow was ready to mediate the political process in the CAR, provided that the African country's government and the opposition address Moscow with such a request.